The popular note-taking app Drafts by Agile Tortoise that is known for its simple and fast entry method has gone 4.0 and brings with it many great new features, including better management, more actions, and integration with Reminders. When Rene reviewed Drafts back when it was originally released, one of his complaints was that it was still sometimes easier to use Siri and Reminders to jot down his thoughts. With the new Reminders integration, he can have the best of both worlds! 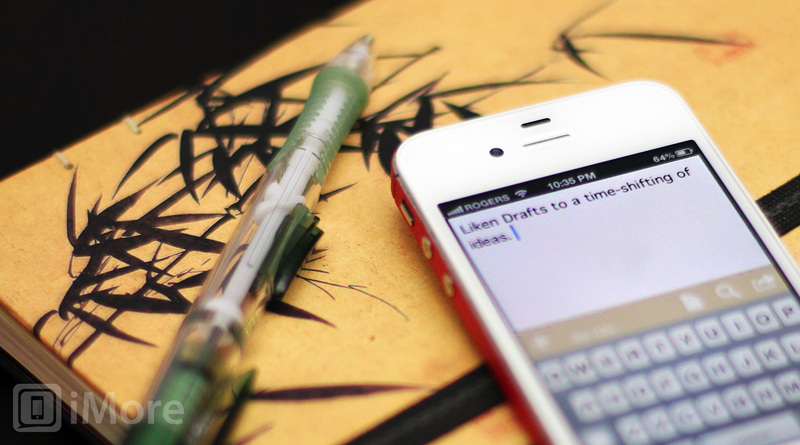 To use Drafts with Reminders, you need to create a list in Reminders named "Drafts". When you add things to that list, then launch Drafts, Drafts will import any incomplete tasks (title and notes) from that list and mark them as complete. Now Rene can use Siri to jot down ideas to the Drafts list, and they will appear in Drafts and disappear from Reminders the next time he opens Drafts. Super cool. The reverse can also be done, and notes in Drafts can be sent to Reminders with the new "List in Reminders" Action. Each line of your draft will be treated as a list item and if the first line begins with a @, #, or !, it will be treated as a list name. If the list exists, the tasks will be added to it, and if it doesn't, the list will be created. Capitalization is considered, so keep that in mind (i.e. "Grocery" and "grocery" are not the same). Another change in Drafts is the new management system that is divided into Inbox, Archive and Pinned panes, making it easy to keep your drafts organized. You can also assign Actions to the panes for easy access and better organization of the long Action list. Other changes include the ability to configure an unlimited number of custom Evernote and Message Actions, an extended keyboard, other Action improvements, and more. This is pretty significant update to Drafts and makes an already great app even better. What do you think of the update? What do you use Drafts for?